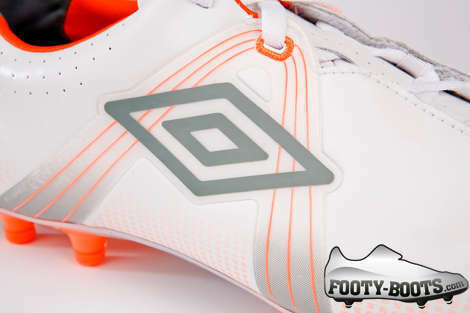 Following on from the other launch of the Umbro GT Pro, Umbro have sent us pictures of their other launch colourway – White/Silver/Orange. 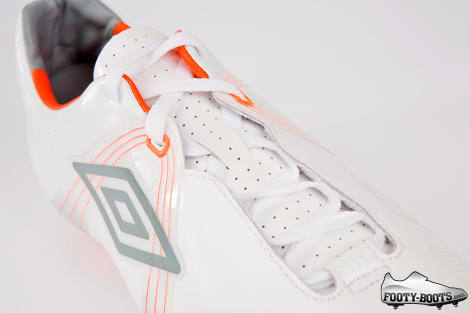 This cool, clean Umbro GT Pro is a far cry from the Black/Blue/Volt that is to be the other launch colourway. The Umbro GT Pro sports the things that we have come to expect from a lightweight football boot; a Teijin Microfibre upper, integrated heel counter and low profile design. What it also brings to the party is a TPU control zone in the forefoot, which is designed to increase surface area on the ball when striking and make it easier to control the ball at high speed. 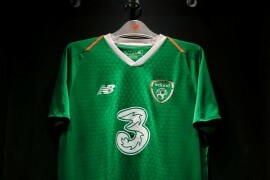 Umbro have also brought the A-Frame technology from the Speciali along, which got the thumbs up from Footy-Boots last year during testing. The idea is the A-Frame integrated with the lacing system, to pull the boot tight around the midfoot – this in turn helps lock the heel into place and minimise blistering. 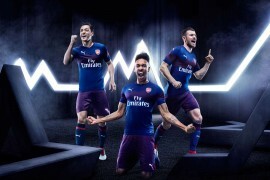 Umbro also claim that the specially placed perforations enhance overall comfort in the football boot, and also assist in ventilation and weight-reduction. Obviously one of the things that Umbro have to consider when developing the Umbro GT Pro is weight, and at 236g, it’s not a bad effort – in fact; it puts it in the same ballpark as the Mercurial Vapor VI. 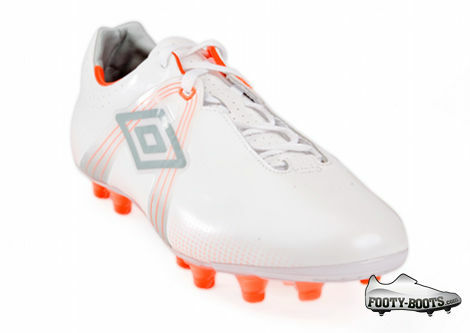 At only £85 for the top-spec Umbro GT Pro, this is the most economical boot to come out in a long, long time. 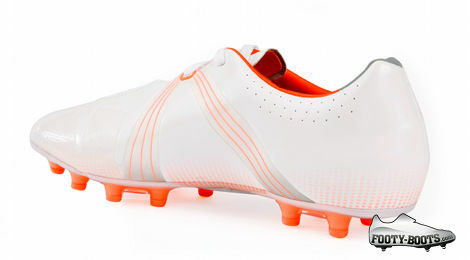 Expect to see this boot in action at the start of the new season, with it’s release date hitting in Mid-August. Taste boots. I’m a big fan of the nike speed boot range but at only ÂŁ85 these have turned my head. nice boots! 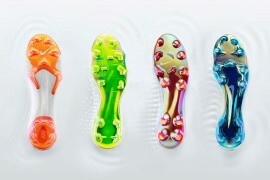 they kinda look like the f50i with the studs of the adizeros. like the price even more!! love the idea of putting the A-frame there, it kinda emphasizes that the A-frame technology really works. just like reebok uses the power unit on all of their soleplate, it emphasizes that the power unit really works and not just another worthless gimmick (let’s face it, if the adaptive studs are THAT good, we supposed to see them on every upcoming nike boots. carbon fiber works, that’s why we see them on all the elites). 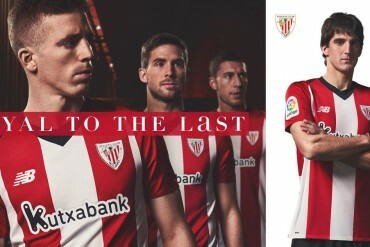 Nicklas Bendtner is meant to have signed to Umbro to wear these. 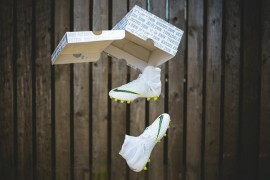 Bought these for my son & we both agree these are by far the best boots he’s ever had! Very strog very very comfortable and light enough these are a 10 out of 10 boot. From a Dad side they are so easy to clean and come up like new every time! Did I mention these were the best boots we ever bought coz seiously THEY ARE!!! Get a pair you won’t be sorry!